Ordering is done using our webstore, by moving products to shopping cart and paying using Fingu Pay service. All customer data is treated confidentially. The contact information gathered during ordering process is used only for product delivery or solving any problems regarding the product or delivery. Ordering products from So Pretty requires you to agree with our terms and conditions. 1- Verifone BlueCommerce : service that allows you to pay for your purchases instantly using your bank's online bankingservices. 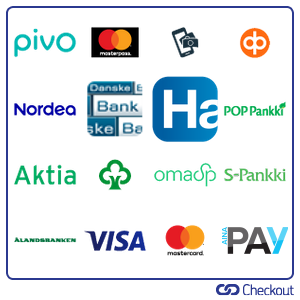 2- Checkout Finland Oy : service that allows you to pay for your purchases instantly using your bank's online bankingservices. Products are normally sent within two days of the order, the exceptions will be informed immediately. Abnormal delivery times will be informed at front page of our webstore. All returns must be agreed in advance with the merchant. Complaints must be filed within 14 days from receiving the product. Returned products have to be in resellable condition. Merchant does not cover the expenditure incurred for a refundunless the refund is not first agreed with the merchant. The returned product and product packaging must be unused. The amendment to the law(since 13/06/2014) refunds are chargeable to the customer, the customer is required to pay a benefit of return shipping. You may wish to use the withdrawal form found on the bottom of the page. Accuracy of contact information: The customer is responsible for the correctness of their contact information. 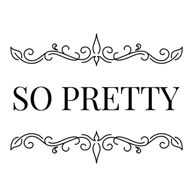 So Pretty is not responsible for delivery issues if the product can not be delivered due to customer's incorrect, or incomplete address information, door code, or telephone number. So pretty shall not refund costs or damages caused by failed delivery resulting from incorrect or incomplete contact information. For all matters relating to orders reach us as follows: by e-mail info@sopretty.fi Phone: +358449790454 send SMS / call request, we will contact you!